Starting points for Mt Somers Track are either from Staveley or Mt Somers township side. We will start track from Mt Somers township side.We will walk from Woolshed Creek Car Park to Woolshed Creek Hut taking the Miners Track.4 hours return, but can be longer depending if we opt to return via the South Face & Rhyolite Ridge Tracks, which is much harder return track (requiring a higher level of fitness as very step going down) and adds approx. another 45 minutes. The plan is to return via the Miners Track which we came on unless the whole group decides otherwise.The track involves some hill work with spectacular views on a nice day.We will be taking the “minors track” option to Woolshed Creek Hut and return.Woolshed Creek has a modern Doc Hutt, with water and toilets.Fitness 2 ½ out of 5 required.TRANSPORTATIONWhat we normally do as we meet at James and Danny Place have a coffee and a bit of a natter then we organise the cars, both James and I can take about 10 people between us!So you can start coming from 7 o’clock as that is when the coffee machine is on! 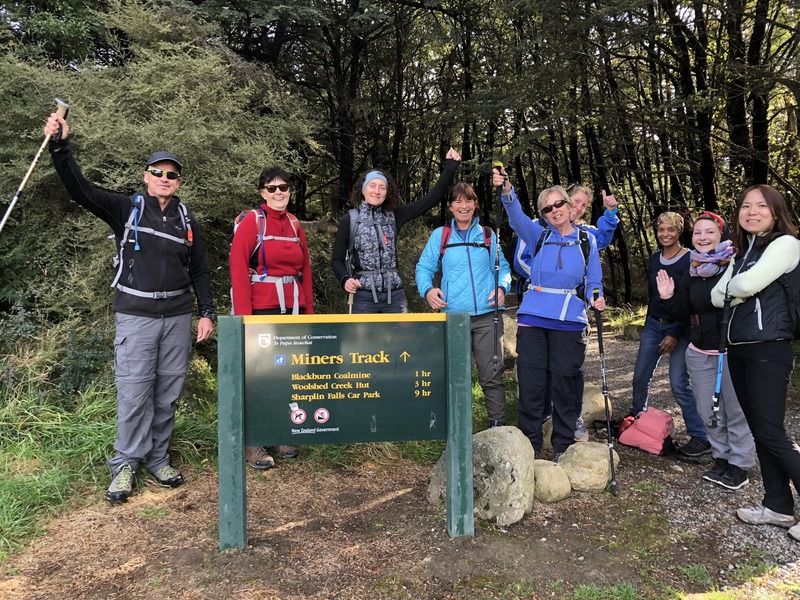 This walk is a bit more drive than other walks we need to get away no later than 7:30 AM so we can meet the others at the The Coffee Club at 8:00am.We will meet at 8am at The Coffee Club, The Hub, Hornby Mall. see http://thecoffeeclub.co.nz/store-locator/the-coffee-club-the-hub-hornby/We will leave at 8.30am on our trip.Car pool will cost $10 per person for the driver for petrol money.Drive time approx. 2 hours one way.We will drive to Rakaia Information Centre where we will stop for a coffee and toilets. You can buy lunch there too.IMPORTANT INFORMATION FOR PARTICIPATIONEssential items to carry:- Water (note that on hot days one bottle is NOT enough)- Food- Warm clothing (even on hot days)- Sun hat and sunscreen- Rain jacket- Strong and suitable footwear (trainers may be suitable on some walks but are often not suitable on mountain walks)Anyone who does not come with the essential items listed above may be excluded from joining us that day. Thank you for understanding that this is for the safety of all participants.Although we encourage anyone to join in and beginners are certainly welcome, please be aware of the fitness level some walks require. If the word 'Mt' is in the title its up a mountain and may not be a good starting walk for beginners or people with lower fitness levels. If in doubt start with one of our easier walks and work your way up.Disclaimer:This group and its organisers take no responsibility for your safety. They are not trained in either first aid or in hiking or outdoor safety. By signing up for these events, you agree to release the group and its event organisers from any responsibility, liability, or claim in law or in equity. If you don't agree to these terms, DO NOT join this meetup event. Epic6 does not certify the expertise of its event organizers - we are all volunteers.If you bring guests to participate in the event you take full responsibility of the guests and agree to all above terms and conditions.Agreement:I have read this document in its entirety. I understand there are risks associated with this activity and I freely and voluntarily assume all risks. I agree to carry the essential items so as not to put myself or other members of the group at risk.